Beautifully engraved SPECIMEN certificate from the Cenco Incorporared dated 1978. 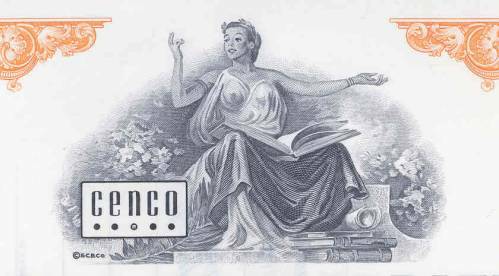 This historic document was printed by the Security-Columbian Banknote Company and has an ornate border around it with a vignette of an allegorical woman with the company logo. This item is over 24 years old. 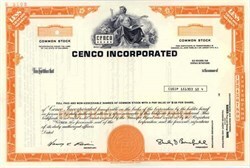 Cenco Incorporared was begun in 1900 as Central Scientific Company. It was formed out of what was left of the Olmstad Scientific Company after a disastrous fire in 1898, which killed the founder and owner, W.A. Olmstad, and ten of his staff. Olmstad had been in the science equipment business since at least 1889. Records are sketchy, but another Chicago Company, the Central School Supply House, may have been involved in founding Central Scientific. From the begining, Central Scientific manufactured and distributed science teaching equipment for schools, colleges, and universities by catalog mail order. The company put out its first complete catalog dated 1903 (but issued in 1904), a larger one in 1909, and a much bigger one in 1915. The trademark "CENCO" was used from 1909 onwards, and is still in use today. By 1915 the company had moved several times, and was then in a facility on East Ohio Street, where they stayed for twenty years. They had also diversified, and were making and selling equipment for industrial laboratories as well, including food testing. Between 1915 and 1935 the company established itself as one of the leading national suppliers of science equipment. Manufacturing expanded considerably; the company had its own engineers and drafting office since at least 1919, and they were early users of chrome plating techniques (1929). An extensive network of sales representatives was established. The company issued a regular newsletter, the "Cenco News Chats," with their own innovations and new products from 1932 onwards. During World War II, part of the manufacturing facility was turned over to war production, making bomb sights for airplanes and fuses for large bombs. Following the war there was a period of rapid expansion, during which branch offices were opened in several states, and a number of companies in related fields were acquired- Soiltest (civil engineering), Refinery Supply (oil equipment), Atomic Labs (advanced education), and Standard X- Ray (medical). The technical vaccum line of products grew very rapidly. The company was also a major exporter of scientific equipment (citation from the Secretary of State, ca. 1961). During this period, the company reorganized as a holding company, CENCO Instruments, Inc., and several specialized subsidiaries (including Central Scientific Company). About 1965 the group went public (NYSE). In 1968 they moved to a very large facility ( 1 million square feet), the "CENCO Center." This was an old truck plant on South Kostner Avenue. "Cenco" now claimed to be the largest science equipment supplier world wide. After 1968, the company began having difficulties. It was large and unwieldy, difficult to keep focused, had troubles with computerization, and needed large investments to replace aging production equipment. The medical activities were not doing well. Insiders of the corporation were involved in a massive fraud that consisted mainly of inflating inventories in the Medical/Health Division far above their actual value. This fraud increased Cenco's apparent worth, as well as the market price of its stock. Thus, Cenco was able to "buy up other companies on the cheap" as well as borrow money at lower rates than if its inventories had been honestly stated. In the litigation that followed discovery of the fraud, the company asserted a cross claim against its independent auditor for failing to prevent the fraud. The Seventh Circuit said that the fraud was on behalf of the corporation: "those involved in the fraud were not stealing from the company, as in the usual corporate fraud case, but were instead aggrandizing the company (and themselves) at the expense of outsiders...."
Two executives went to jail. The company's stock plummeted. The assets of the group, including Central Scientific Company, were sold off to competitors and other buyers.